Mohammed Bada of Kismet Yarns shares his knowledge of global yarn trends. 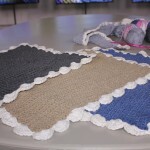 His sister Fatimah will then show us how to create a colorful throw and then later Gloria makes a table mat. Using the 1st colour and a 6mm hook, chain 4 and join with slip stitch to form a ring. Round 1:Ch3,2dc in ring,ch 2, then *3dc in ring &ch2 * (*repeat 3times),join with slip stto the beginning chain. You should have 4 sections with 3 dc in each section and spaces with 2ch in between these sections. These spaces will become the corners of your square. Fasten off. Round 2:With right side facing you, join 2nd colour in any ch 2 corner space, by knotting the new colour to the chain. Then, working in the same space, create the first corner of your square by doing ch3, 2dc,ch2, 3dc. Next,ch1 and start working in the next chain space of the first colour, to create the next corner of your square. *Do 3dc,ch2 and 3dc. inthe next ch 2 space*. Repeat from * to * to complete round 2. After completing the fourth and last corner, ch 1 and join to the beginning of this round using a slip st at the top. At the end of this row you should have 4 corners, each one with a set of 3dc, a 2ch space & another set of 3 dc, a total of 8 sets of 3dc, four ch2 spaces and four ch1.Fasten off. Round 4: With right side facing you, join 4th colour in first ch 1 space to the left of any corner ch 2 space. Next, ch 3, 2dc in same space. Then *ch1, and 3dc in next ch 1 space, followed by ch 1, then (3dc,ch2,3dc) in corner ch2 space to create the corner. Then,ch 1, 3 dc in next ch1 space*. Repeat from * to * until you complete this round. Join with slip st in top of beginning chain. At the end of this round you should have 16 sets of 3dc, four ch 2 spaces &twelve ch1 spaces. Fasten off. Round 5:With right side facing you, join 5th colour in first ch 1 space to the left of any corner ch 2 space. Then ch 3, 2dc in same space. Next, *ch1 and 3dcin each of the next 2 ch1 spaces, followed by ch1, then (3dc,ch2,3dc)in corner ch2 space to create corner. Then, ch1, 3dc in next ch1 space. * Repeat from * to * until you complete this round. Join with slip st in top of beginning chain. At the end of this round you should have 20 sets of 3dc, four ch 2 spaces & sixteen ch1 spaces. Fasten off. Round 6:With right side facing you, join main colour in first ch 1 space to the left of any corner ch2 space. Then ch3,2dc in same space. Next,* ch1 and 3dcin each of next 3 ch 1 spaces, followed by ch1, then (3dc,ch4,3dc)in corner ch2 space to create corner. Then,ch1,3dcin next ch1 space. * Repeat from * to * until you complete this round. Join with a slip st in top of beginning chain. At the end of this round you should have 24 sets of 3dc, four ch 2 spaces & twenty ch1 spaces. Fasten off. Squares are joined to each other by attaching them at the corners, and on each side, as required. Round 6 (joining rounds): Follow the instructions in Step 6, until you reach the point where you need to make a 4ch in the corner. At this point, you join the ch4 spaces by working ch2, then drop loop from hook. Insert the hook in the corresponding ch 4 space of the other square,draw dropped loop of the first square through, then ch 2. Join the squares on the sides as follows: the second dc of each 3dc group by working (2dc,drop loop from hook,insert hookin corresponding dc of the other square,draw dropped loop through, 1dc). You can also join in ch1 space as follows: work ch1, drop loop from hook,insert hook in corresponding ch1 space of the other square,draw dropped loop through, then ch1. Complete round 6 as per step 6 and fasten off. Once all the squares have been joined together, finish off your blanket by making a border as follows: Round 1: With right side facing you, join main colour with a slip st in any ch 1 space to the left of any corner ch4 space. Next, ch3 and 2dc in same space followed by ( ch1&3 dc) in each ch1 space and each joined ch4 space. Continue in this way until you complete a side and reach the corner of the blanket. To form the corner, do (3dc, ch4 and 3 dc) in corner ch4 space, Repeatthe above until the border on all 4 sides and corners is complete. To finish, join with slip st in top of beginning chain. Round 2: With smaller hook,slip st in next dc, *ch1,(sc,ch2, sc) in same dc, then ch1,(sc,ch2,sc) in center dc of next 3 dc group*. Repeat from * to * until you reach the corner, then ch1, **(sc,ch2, sc,ch3, sc,ch2, sc) in next ch4 corner space**. Repeat from * to * for all sides and from ** to ** for all corners. When round 2 of the border is complete, join with slip st in first sc.Fasten off.Weave in any loose threads and your blanket is now complete and ready to be used. 2 balls of yarn from the Strawberries and Cream collection as your main colour. Continue until you have 37 rows altogether to complete the size of your placemat. *5dc into one st, skip one st, one sc, skip one st**. Repeat from* to ** along edge up to the corner. Skip one st, then (one dc, one tc, one dc) into the corner st, slip one and continue in edging stitch. Once you have edged all four sides in this way, your placemat is now complete and ready to be used.